Redeveloping a kitchen can be very expensive, and you might not get back all the money invested in selling. Instead of redoing everything, you can make small changes to get your kitchen up to date. Opt for a new painting rather than new closets and change your appliances. If the equipment is really old and you decide to replace it, do not necessarily choose the most upscale. A clean, fresh and bright kitchen is enough to attract buyers, without having to leave all your savings. 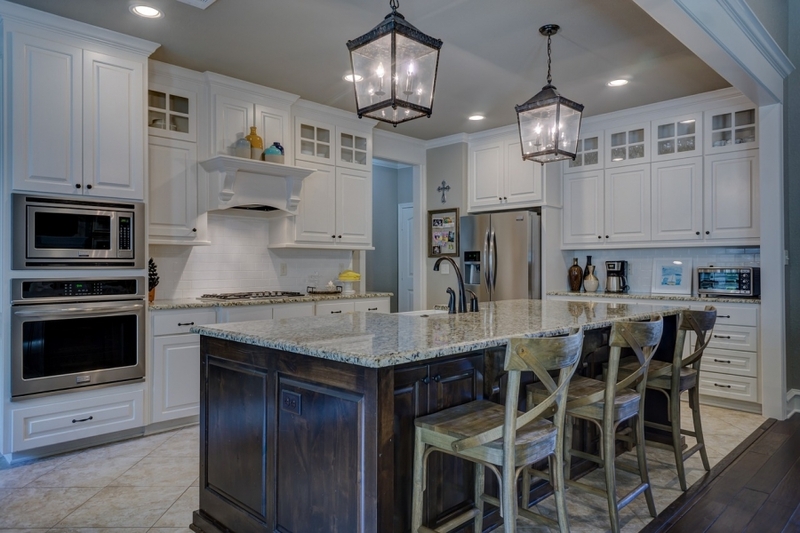 Here are some tips for preparing your kitchen before selling your home. Rearrange your kitchen by clearly defining your different goals. ---> Must be clean and smell good. ---> Must look spacious and unencumbered. There is enough space in the drawers and cupboards. ---> Must be tastefully decorated: there must be no ugly or dated objects. ---> Must be welcoming: the buyer must be able to easily imagine using it and appreciate the space. ---> Must be alive without being messy. Having your kitchen cleaned by a professional is a very good investment if you plan to sell your house. Sure, you could just as well do it yourself, but would the result really be so good? A kitchen is at its best when it is sparkling. Be sure to remove all trash cans, recycling bags and pet accessories before making visits, and be sure to clean the inside and bottom of the bins. Spread a lemon under your trash. There is nothing worse to let a potential buyer spin than a bad smell. Be sure to remove all trash cans, recycling bags and pet accessories before making visits, and be sure to clean the inside and bottom of the bins. Spread a lemon under your trash. There is nothing worse to let a potential buyer spin than a bad smell. The refrigerator is another place to be attended to - refrigerator odors oftentimes carry far past the kitchen. Repair Aid, a professional appliance repair company, advises on how to solve this problem in this post. Outside the household, you will get your money back if you redo the paintings. Spend a new layer in your kitchen, with a hue in harmony with the color of your closets and worktops. If you have a doubt, go for white. Even if your kitchen is new, look carefully at the walls and ceilings, and make the necessary adjustments, even the small ones. Organizing your kitchen is the first step to move on, which is not always easy. If you are preparing your house for sale, it is time to no longer think of it as your home, but as a property about to be sold. This preparation, if done well, can make your home more attractive and speed up your sale. It is even sometimes possible to obtain more than originally hoped for. It is better to make the best possible impression from the beginning so that you do not have to endure the incessant visits. Keep this in mind during your preparations. Clean the windows, both inside and out. If your windows are equipped with awesome curtains, consider removing them, or at least making sure they are well drawn during the visits. A toaster and coffee maker are the only things you can stay on the counter. Everything else must be tidy. Potential buyers will look inside your closets. And if they are overloaded, it will give the impression that there is not enough storage space in your kitchen. Remove any excess, or mismatched items, and anything that does not make a good impression. If you still need these items, keep them in a box that you place at the top of a shelf or cupboard during visits. Reduce the contents of your pantry until there is empty space on each shelf. Arrange this leftover in matching boxes or baskets. It may be necessary to remove food, but remember that a well presented kitchen is not necessarily a practical kitchen. As with the objects in your closets, keep the extra items in a box that you will hide for visits. People have a special relationship with wall shelves: we love or hate. They can be very beautiful, but are a real challenge when it comes to keeping them in order. If you have some in your kitchen, your goal will be to show visitors that they can be useful and beautiful. Leave some empty space on your shelves and expose only the matching dishes you use every day. The best option is once again the white dishes and the transparent glasses. Dispose of old sponges and dishwashing liquids, and replace them with an original soap, a nice dishwashing liquid dispenser and a lotion, all well presented on a tray. A clean and bright faucet always makes a good impression. Also be sure to repair any leaks. A nice cookie or kettle on the hobs is a welcoming touch. Just make sure that what you choose is in perfect working order and without any scratches. New tea towels are at the top of the list when you want to present your kitchen. They are an inexpensive way to add some color and pattern, especially in an all-white kitchen that might otherwise look bland. Everything that is ripe and pretty will do the trick. Choose beautiful fruits and arrange them in a basket, a salad bowl or in a cake dish. Just like the fruit basket, freshly cut flowers, branches or aromatic plants in jars bring life to your kitchen. No need to spend a fortune: in this kitchen, for example, sunflower-style flowers, cheap, have been arranged in a transparent vase, and a row of lemons rests on a white dish. This arrangement is easy to achieve, inexpensive, while being the most beautiful effect. Cookbooks are an accessory that makes cooking attractive and useful. But think of sorting in your books: keep a single row, taking care to choose books in good condition. If you do not have a shelf, you can have a small stack on the worktop.